In 1990 U.S. citizens generated over 4 pounds of solid waste per day, or over 1500 pounds per year. Individuals in most other developed countries generate only half that amount. Over 39% of municipal solid waste is paper, something we can easily reduce. Most communities dispose of solid waste in sanitary landfills by dumping it on the ground and covering it each night with a fresh layer of soil. Rainwater can infiltrate the waste and dissolve material to form a “leachate” solution, so modern landfills have liners and leachate collection systems that prevent the leachate from contaminating the underlying groundwater. However, unregulated and pre-regulation landfills have extensively contaminated groundwater aquifers. There are about 3,000 landfills in the U.S.. Most people don’t want a landfill sited near their home, an example of the NIMBY (Not In My Back Yard) syndrome. Also, because expansion of urban centers and overall population growth make it difficult to find suitable locations for landfills, the number of landfills and the capacity of landfills in the U.S. have been decreasing, and some cities are finding it hard to find places that can accept their waste. The most famous example was of a garbage barge that in 1987 could not find a facility to accept their waste, and after traveling over 5,000 miles over 112 days it finally unloaded its waste at an incinerator in Brooklyn, New York (http://www.nytimes.com/1987/07/11/nyregion/trash-barge-to-end-trip-in-brooklyn.html). Two alternative approaches are to recycle and to incinerate waste. Until 2007, the city of Nashville burned their garbage and used the released energy to heat and cool metro buildings downtown. However, the smell of the garbage, the increasing value of the riverside property that the incinerator was located on, and the fear that the incinerator released heavy metals from its’ smokestack, led the city to close the operation. 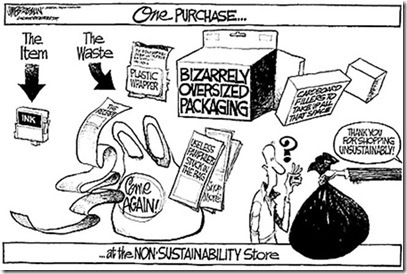 Your effort to reduce waste must start at the beginning, when you are in the purchasing phase . First, don’t buy a product unless you need it. Never buy disposable products or junk that will need to be replaced frequently. Next, buy products with minimal packaging, avoiding those that are “individually wrapped”. Choose products that are made from recyclable materials, not plastics that can’t be recycled . When possible, buy products with provisions for returning or recycling the used product. Always remember to bring your reusable bags when you go shopping, and place fruit and vegetables directly in the bag rather than using the plastic bags in the produce department. Save some trees and use less paper: don’t subscribe to newspapers or magazines, since most of the information they contain can be obtained online. This semester I taught a class on Sustainability, and we went almost completely paperless (e.g., term papers were turned in, graded, and returned electronically). When you use paper in the office, always print double-sided, or reuse paper that has been printed on only one side. The mantra for reducing waste is the 3 R’s: Reduce, Reuse, and Recycle, in that order (http://en.wikipedia.org/wiki/Waste_hierarchy). It’s best to reduce by consuming less. For example, I run a chemical laboratory at Vanderbilt University. We used to buy chemicals in bulk to reduce the cost per unit volume. However, we rarely ended up using all of the chemicals. When labs are closed down (when Professors retire), large amounts of chemicals, some hazardous, must be disposed of at great expense. When you consider that the environment was degraded twice, both in the production and disposal of the waste, and the fact that the chemicals were never used, it all seems very wasteful. Now we buy small quantities of chemicals, and purchase replacements when needed. There are numerous references that give ideas on how to reuse and repurpose materials. For example, Jeffery et al. suggests that we reuse plastic bags after washing, use empty glass jars as storage containers (it’s nice to see what’s inside a container without opening it), shop at second-hand clothing and book stores, and reuse wrapping paper. Reusing and repurposing items is also an opportunity for you to think “outside the box” and be creative. I personally always reuse disposable paper and plastic shopping bags. I store recyclables in the paper bags until they become unusable, and line garbage cans with the plastic bags. We forgo our reusable shopping bags only when we run out of disposable paper or plastic shopping bags. We donate our used clothes to Goodwill unless they are in bad shape, in which case we cut them up and use them as rags. Though I love books, I now avoid purchasing them, and instead sign them out of the library to save both money and paper. Many charities accept used goods for reuse. This year we donated a computer to the National Christina Foundation. I personally found it rewarding to fix the computer up and then drop it off at a school for children from low-income families. Goodwill accepts many types of items and resells them in their stores. We have donated furniture and electronics to Amvets, and many charitable organizations are in need of used cars – you can claim a nice tax deduction for donating an old car instead of taking it to the dump. Recycling is often the first concept that comes to mind when people discuss green living. That’s because we can recycle without really changing our lifestyle, so it is comparatively easy. Just throw the item in a recycle bin rather than a trash can. However, not everything can be recycled, especially when we consider cost. Moreover, not everything needs to be recycled, as I will now demonstrate. Students in my Sustainability class were upset when they learned that Vanderbilt recycles paper, plastic, and aluminum, but not glass. That got us talking about reasons for and costs of recycling. I noted that glass is a harmless material that is costly to recycle. Glass is made by melting beach sand containing silicate minerals like quartz (SiO2). The sand melts over a range of temperatures, and isn’t completely molten until temperatures of around 1200°C (this temperature is lowered by addition of fluxes such as lime CaO, soda Na2O, and sometimes Borate B2O3). To heat it to such high temperatures requires a lot of energy. It takes a lot of energy to remelt the glass during recycling, and because glass is relatively inert and won’t cause environmental damage when disposed of in a landfill, forgoing recycling was not as evil as they perceived. On the other hand, glass recycling uses less energy than manufacturing glass from sand, saving 315 kg of CO2 for every ton of waste glass recycled (http://en.wikipedia.org/wiki/Glass_recycling), so recycling glass is still preferable. The best option is to reuse the glass, so it doesn’t have to be remelted. The material that saves the most energy by recycling is aluminum. Aluminum ore is called bauxite, and it contains aluminum oxides that must be converted to metal. This means the Al3+ in the oxide must be reduced to metallic Al0 by adding three electrons, which requires a lot of energy because Aluminum prefers to be in the +3 state. This also means that Al metal will oxidize when in contact with oxygen in the atmosphere, but fortunately the process is very slow. Al metal has a very low melting temperature, so it takes a lot less energy to recycle the aluminum by heating and melting it than it would to mine more bauxite and convert the oxide to the metal. The other thing to keep in mind is that it only makes sense to recycle materials when there is a market for the recycled product. For example, recycled paper is generally inferior to first-use paper, so different uses must be found for it. Fortunately, clever people are thinking of many new uses for reused and recycled products. Whenever you are about to throw something in the garbage, think about whether that item can be reused or recycled. Repair it, or find someone who could use it, perhaps by selling it on eBay. Consider whether the waste is hazardous, which would require special disposal (we will discuss this in the next section). Don’t just throw it in the garbage without thinking! 1. Jeffery, Y., L. Barclay, and M. Grosvenor, Green Living for Dummies. 2008: For Dummies. This entry was posted in Environment, Pollution, Sustainability, Waste. Bookmark the permalink.